At Bristol Motor Speedway, Bristol, Tenn.
1. (9) Kurt Busch, Ford, 500 laps, 46 points. 2. (1) Kyle Larson, Chevrolet, 5048. 3. (2) Chase Elliott, Chevrolet, 500, 50. 4. (19) Joey Logano, Ford, 500, 45. 5. (14) Erik Jones, Toyota, 500, 39. 6. (16) Clint Bowyer, Ford, 500, 44. 7. (10) Ryan Blaney, Ford, 500, 46. 8. (22) Alex Bowman, Chevrolet, 500, 30. 9. (13) Jimmie Johnson, Chevrolet, 500, 32. 10. (6) Kevin Harvick, Ford, 500, 36. 11. (23) Trevor Bayne, Ford, 500, 26. 12. (24) Ryan Newman, Chevrolet, 500, 25. 13. (18) Austin Dillon, Chevrolet, 500, 24. 14. (7) Denny Hamlin, Toyota, 500, 23. 15. (26) Kasey Kahne, Chevrolet, 500, 22. 16. (11) Brad Keselowski, Ford, 499, 21. 17. (15) David Ragan, Ford, 499, 20. 18. (21) Daniel Suarez, Toyota, 499, 19. 19. (28) Chris Buescher, Chevrolet, 499, 18. 20. (3) Kyle Busch, Toyota, 497, 17. 21. (32) Ty Dillon, Chevrolet, 496, 16. 22. (29) Matt DiBenedetto, Ford, 496, 15. 23. (5) William Byron, Chevrolet, 496, 14. 24. (12) Ricky Stenhouse Jr, Ford, 495, 13. 25. (39) Landon Cassill, Chevrolet, 493, 12. 26. (35) Ross Chastain, Chevrolet, 492, 0. 27. (40) Blake Jones, Toyota, 485, 10. 28. (37) Timmy Hill, Ford, 481, 0. 29. (20) Jamie McMurray, Chevrolet, 435, 8. 30. (17) Martin Truex Jr, Toyota, accident, 431, 7. 31. (8) Aric Almirola, Ford, 428, 19. 32. (34) JJ Yeley, Toyota, accident, 423, 0. 33. (36) Reed Sorenson, Chevrolet, accident, 338, 4. 34. (30) Corey Lajoie, Chevrolet, electrical, 234, 3. 35. (33) Jesse Little, Toyota, accident, 59, 0. 36. (4) Paul Menard, Ford, accident, 28, 1. 37. (31) Michael McDowell, Ford, accident, 10, 1. 38. (27) Bubba Wallace, Chevrolet, accident, 3, 1. 39. (25) AJ Allmendinger, Chevrolet, accident, 1, 1. 40. (38) Gray Gaulding, Chevrolet, accident, 1, 1. Average Speed of Race Winner: 89.543 mph. Time of Race: 2 hours, 58 minutes, 35 seconds. Margin of Victory: 0.367 seconds. Caution Flags: 9 for 70 laps. Lead Changes: 19 among 9 drivers. Lap Leaders: K.Larson 1-13; K.Harvick 14-15; K.Larson 16; R.Blaney 17-62; K.Larson 63; R.Blaney 64-130; A.Almirola 131; K.Harvick 132-137; C.Elliott 138-191; R.Blaney 192-199; A.Almirola 200; J.Logano 201-254; K.Larson 255; J.Logano 256-296; C.Elliott 297-354; K.Larson 355; C.Bowyer 356-441; R.Newman 442; C.Bowyer 443-476; Ku.Busch 477-500. Leaders Summary (Driver, Times Led, Laps Led): R.Blaney, 3 times for 118 laps; C.Bowyer, 2 times for 118 laps; C.Elliott, 2 times for 110 laps; J.Logano, 2 times for 93 laps; Ku.Busch, 1 time for 23 laps; K.Larson, 5 times for 12 laps; K.Harvick, 2 times for 6 laps; A.Almirola, 2 times for 0 laps; R.Newman, 1 time for 0 laps. 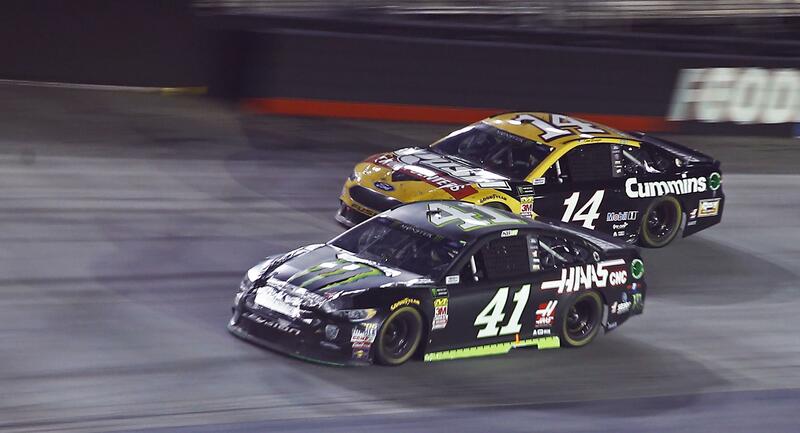 BRISTOL, Tenn. – Kurt Busch stole the spotlight from his younger brother Saturday night at Bristol Motor Speedway to snap a 58-race winless streak and grab an overdue short track victory. Busch won for the first time this season – first since the 2017 season-opening Daytona 500 – but it was his sixth victory on the 0.533-mile bullring he once dominated. Busch once won three consecutive times on the Tennessee track and was considered the best in the business on the concrete oval. Then his younger brother learned his way around the place, and Kyle Busch became the master of the track. Kyle Busch has seven Cup wins at Bristol, 21 combined across NASCAR’s national series. He’s so good that he chose the song “All I Do Is Win” by D.J. Khaled to play as he was introduced before the race. The crowd responded with a thunderous jeering, and Kyle Busch’s eventful evening was off to a roaring start. He triggered a 15-car accident just two laps into the race, fell two laps off the pace, came back to race Martin Truex Jr. for second, and moved Truex out the way late in the race. His late spin set up the final restart that helped Kurt Busch seal the victory. A frustrated Truex kicked his car in anger after the incident, and as Kyle Busch was tending to his wounded race car, older brother Kurt battled Stewart-Haas Racing teammate Clint Bowyer for the lead. Kurt Busch was relentless on the restart and got his Ford to the front, then came Kyle Busch’s spin for the ninth caution. Kurt Busch had a good restart and Kyle Larson, on fresher tires, desperately tried to catch him. Kurt Busch held him off and Larson, winner of the Xfinity Series race Friday night, finished second in his bid for the Bristol sweep. The victory was the 30th of Kurt Busch’s career and he and Kyle Busch became the only brothers in Cup history with 30 wins each. It was Kurt Busch’s first Bristol victory since 2006. Kyle Busch ranks fifth on Bristol’s career list, while Kurt Busch broke a tie with Jeff Gordon for sixth. The ninth driver to win this season, Kurt Busch earned a spot in the 16-driver playoff field. The victory was the 13th for Stewart-Haas Racing since it joined Ford last season, and the 100th Cup victory for the Fusion. Kyle Busch wound up 20th. He led the first 70 laps of the Xfinity Series race but wrecked with a flat tire, so his Bristol weekend was a bust. Although they have yet to win a Cup race this season, Larson, Ryan Blaney and Brad Keselowski scored enough points to clinch berths in the playoffs. There are two races remaining before the playoffs begin. Larson thought he’d get in via a victory at Bristol, where he’s finished second five times between Cup and Xfinity. He lost four races to Kyle Busch, now one to Kurt Busch. “Probably the most frustrating Bristol race I’ve had just because I never really felt like I had a shot to win,” Larson said. Truex Jr. has never won on a short track and felt he had a chance to snap that streak at Bristol. He was running second behind Bowyer when Kyle Busch tapped Truex’s rear bumper to cause Truex to wreck. Truex was so angry, he threw pieces of equipment to the ground and gave the side of his Toyota a hard kick. Truex was also frustrated with himself for not moving Bowyer out of his way and taking the lead. Had he done that, he wouldn’t have been in position for Busch to make contact with him. “If we could race here every Saturday and Sunday, our grandstands would be packed, our TV ratings would be very high. Let’s build more Bristols,” said runner-up Kyle Larson. The Cup Series is off next weekend and races again Sept. 2 in the Southern 500 at Darlington Raceway in South Carolina. Denny Hamlin won last year’s race. Published: Aug. 18, 2018, 2:57 p.m. Updated: Aug. 18, 2018, 8:11 p.m.